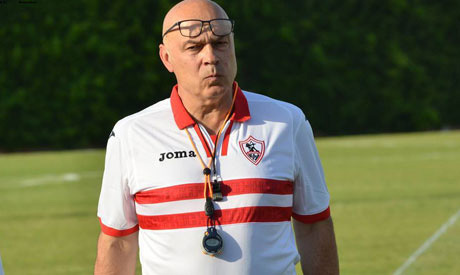 After beating Morocco's Ittihad Tanger and reaching the African Confederation Cup group stage, Zamalek coach Christian Gross has praised performance of his team's players during the game. After last week's playoff first-leg ended goalless on the road, Zamalek defeated Ittihad Tanger 3-1 before the Whites' enthusiastic fans at Alexandria's Borg El-Arab Stadium. "You have to play well to beat a good team like Ittihad Tanger; it was a tough game," Gross told a post-game press conference. "We started the game with a good performance, but we retreated and gave a chance for our opponents to score," Gross said. "After their goal we managed to score two brilliant goals to come back to the game," Gross added. The draw for the CAF Confederation Cup group stage will take place Monday. Egyptian Premier League leaders Zamalek are set to face runners-up Pyramids in the postponed game from the tournament Thursday. "Now we have to prepare well for the game against Pyramids," Gross said. Zamalek are leading the Egyptian Premier League teams' table with 41 points, three points ahead of second placed Pyramids.